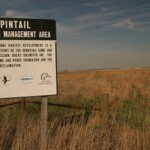 Habitat includes 268 acres of marsh, 185 acres of cropland and 25 acres of pastureland. A large basin southeast of Aurora that includes a shallow seasonal pond and mixed upland and lowland habitats. 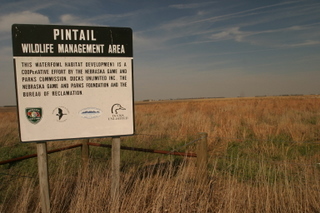 In wet springs this shallow marsh may attract up to 100,000 geese, primarily white-fronted, and is a favorite stopover for pintails and white-fronted geese. In the mornings, a new parking lot on the east side provides the best viewing access to the marsh. During afternoon the west side is better and the road is closer to the marsh. Some people use the old duck hunting dugouts on the southwest corner as viewing blinds. Look for pheasants, northern harriers and migrating peregrines in the uplands. Shorebirds, waders, American white pelicans, black terns, and a variety of waterfowl rest here during spring migration.